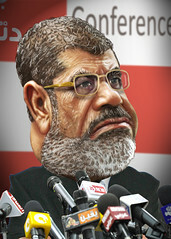 Via: Egyptian democracy a long way off – Eureka Street. Events in Egypt are unfolding so rapidly that Egyptians woke up with one head of state — President Mohamed Morsi — and went to sleep — if they could — with another. The Chief of the Armed Forces has suspended the constitution and parachuted Adli Mansour, head of the constitutional court, into the role of interim president. With events moving at such breathless speed, and no less complicated because of it, any commentary should be modest. Particularly from the other side of the world. Let us begin with what is clear. After a year in power, the first democratically elected president of Egypt has been ousted by the military, emboldened by widespread popular support. Now, in the memorable words of Donald Rumsfeld, the known unknowns. Were more people revolting against the regime than who had voted for it? Protest is, after all, a form of democratic expression. Sexual violence is NOT.